In July 2014, Lydia volunteered at the Borneo Orangutan Survival Foundation centre in Indonesia, caring for sick and orphaned orangutans. We caught up with Lydia to ask her to share some her experiences. The centre is based in central Kalimantan on the island of Borneo, and is home to around 600 orangutans, most of which have been rescued from the illegal pet trade or from areas of deforestation. The centre exists to rescue and rehabilitate the primates, so that they can be released back into the wild in safe forest reserves. I worked alongside the veterinary team screening orangutans before release and helping to medicate those sick with malaria and other parasitic illnesses. 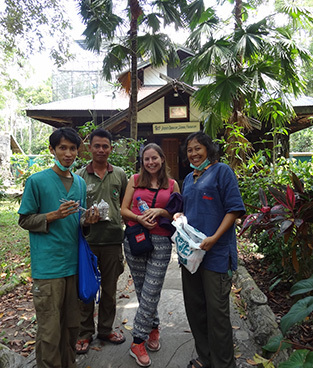 The team (of six vets) are dedicated to their patients, caring for the orangutans 24 hours a day, and often sleeping on site. Having worked in veterinary practices in the UK what struck me was how well the vets worked with often very basic equipment. Due to the high humidity in Borneo it is very difficult to maintain sterility, as surgical equipment rusts very quickly. I decided upon my return to the UK to find new equipment for the centre, so that they could replace the old rusted kits. I starting collecting unwanted surgical instruments from my practice, and it soon became apparent that many of the things that we discard could be used abroad, such as blood vacutainers past their use by date, sterile gloves and bandages. By the summer I had collected a sackful of equipment, and returned to Indonesia to donate it to the sanctuary. At first things did not go to plan: a volcano erupted, and not only were all my flights cancelled, but this also coincided with Ramadan (the biggest Muslim festival of the year), that is the busiest time to travel in Indonesia! Eventually I arrived in Palangkaraya, the closest city to the orangutan centre, and was met by one of the vets from Nyaru Menteng. He couldn’t believe that some of the donations I had brought may have ended up in the bin! 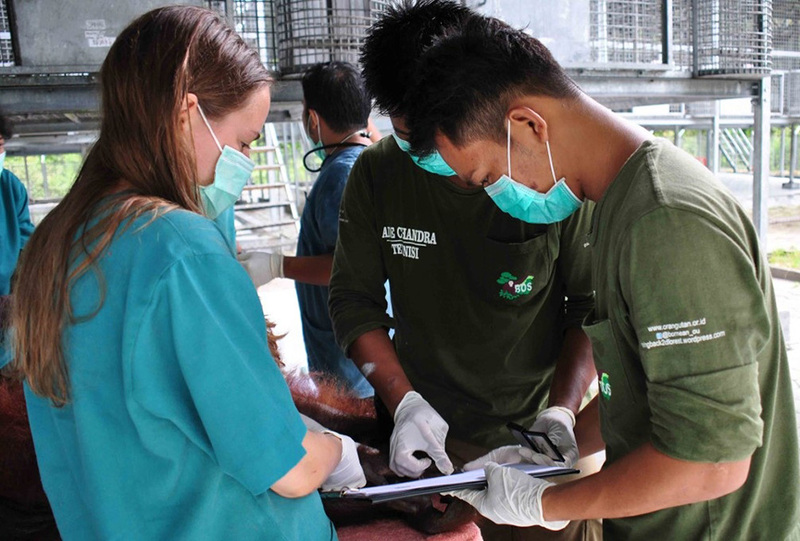 The surgical equipment I had brought was almost immediately put to good use, as there was a rescued Gibbon that had been injured and required surgery. This experience has spurred me on to collect more unwanted equipment to send abroad. Out of date supplies that may be considered inappropriate for use in the UK is often gladly received in other countries and will be gratefully received. If you have any equipment that your practice does not use, or is thinking or discarding, please donate it instead! Anything from out of date or old equipment, scrubs, or even unwanted veterinary samples would be appreciated. If you would like to make a donation, please bring it to The College of Animal Welfare in Potters Bar, or get in touch with me via lpsmith30@gmail.com. 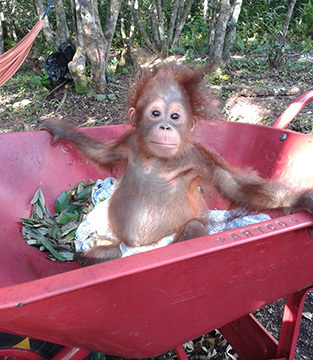 For more information on the Borneo Orangutan Survival Foundation, go to http://orangutan.or.id/.